I think this is a relatively new colorway of Handmaiden Seasilk - it's called Turkish Delight, and something about the combination of bright grapefruit pink, orange, and minty green really drew me. I always love bright colors, but these colors are a little different, a citrusy departure from my usual saturated magentas, greens and purples. I think it's going to become another simple small shawl - I'm thinking either Shetland Triangle or the Flower Basket shawl, both Evelyn Clark patterns with relatively simple repeats that would show off the colors really well. I might have to cast on for it soon; I'm really excited to see how it knits up! Today's Fashion School Blows My Mind moment: today I learned how to draw different types of bows, pleats, and ruffles. It's really cool to go from recognizing particular styles to being able to draw those styles in an accurate way. Next week I get to come up with my own original dress to draw in class! Because I am a crazy person, I started yet another lace project. I got a skein of Madelinetosh Prairie a couple of months ago while out with my mom, and wasn't sure what to do with it. 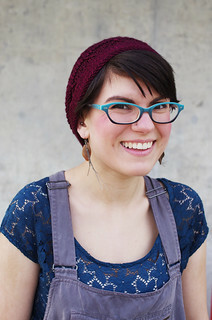 Then I remembered Ene's Scarf, one of the many stellar patterns from Interweave's Scarf Style. I've had the book forever - I originally bought it because I fell in love with the many Lady Eleanor stoles that were floating around the blogosphere. I did make one scarf from the book, but then put it away, which is a shame because it is a veritable treasure trove of great patterns. Ene is constructed much like Miralda: a long (long long) cast-on that decreases by 4 stitches each row until you graft or three-needle bind off the last 20-odd stitches. 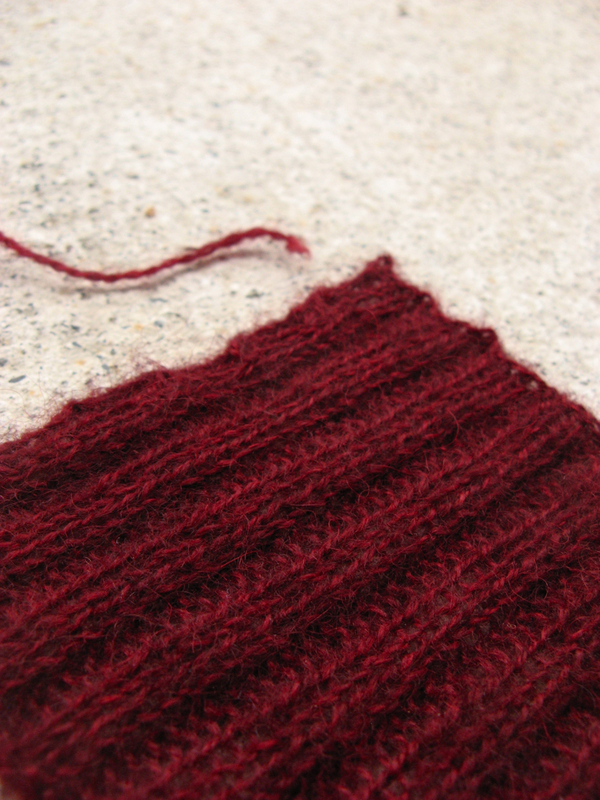 One change I've already made is to add two rows of garter stitch right after the cast-on. I knew I had about 100 extra yards than recommended, so I'm not worried about running out by adding more rows. 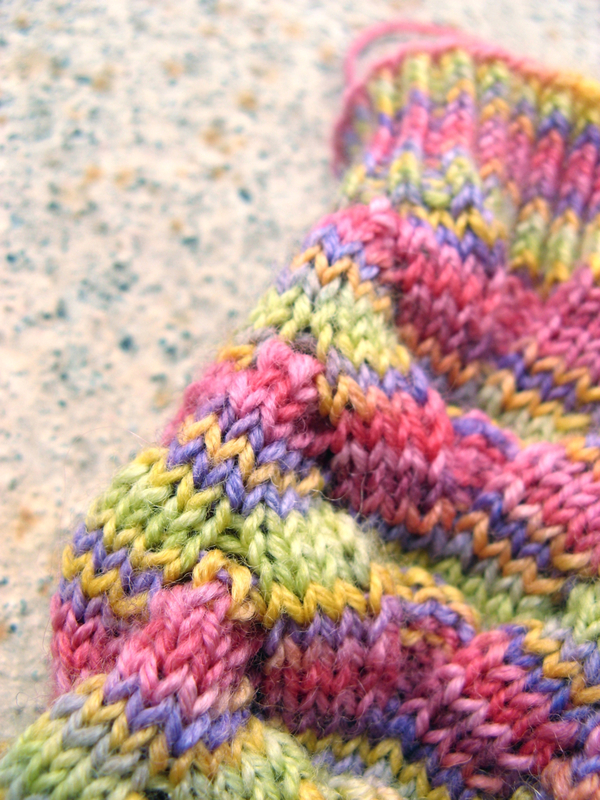 Miralda has this little garter border before the main edging pattern, and I like the contained polish it gives. I was also wary of jumping right into the edging as recommended in the pattern, for fear of curling. 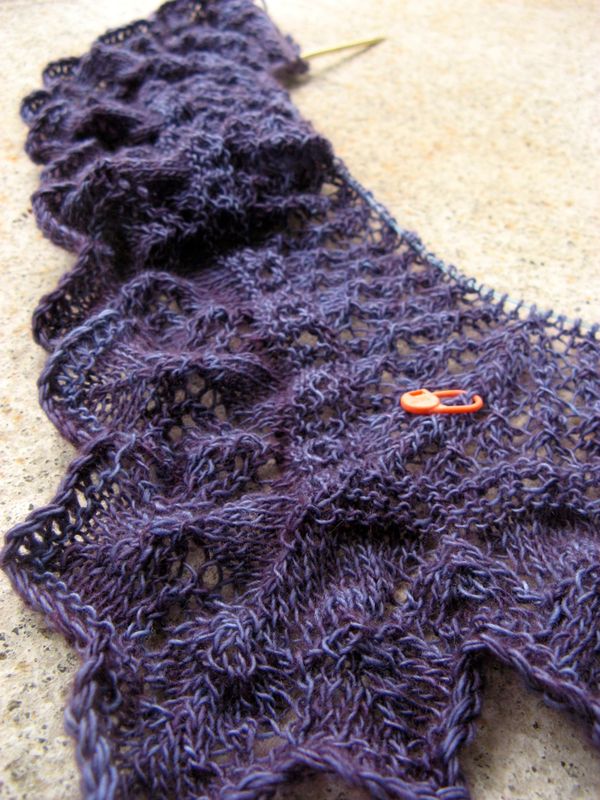 So far, the Prairie is one of my favorite true laceweights ever. It's more substantial in the hand than Artyarns Cashmere 1, softer than Tosh Lace (a plied laceweight), and more pleasant for my alpaca-sensitive fingers than Silky Alpaca Lace. The only other laceweight for which I have felt such affection is Jaggerspun Zephyr, which has a lovely (and addictive) fluffy-yet-shiny feel and look. 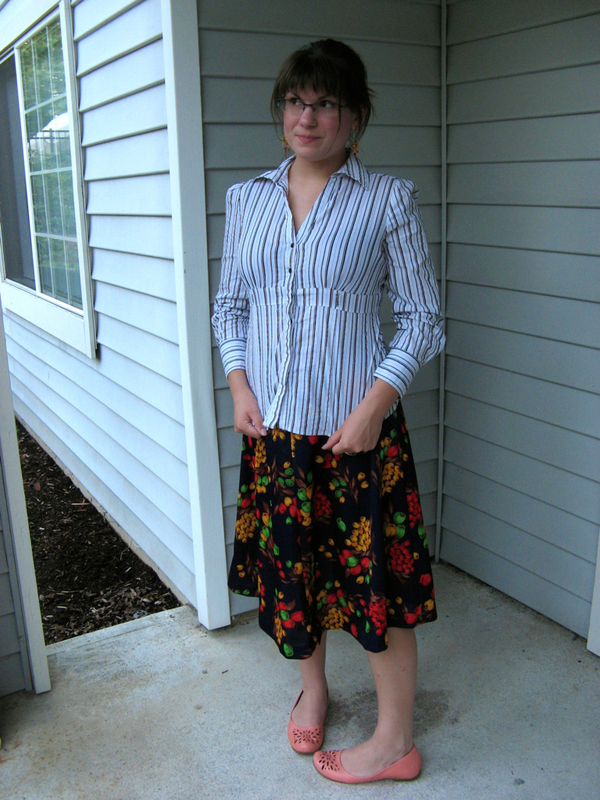 The Prairie has a little bit of sheen, great depth of color, and a weightlessness of the fabric despite being heavy enough to work with easily. Seriously... at this point I'm totally fighting the urge to buy All The Tosh. 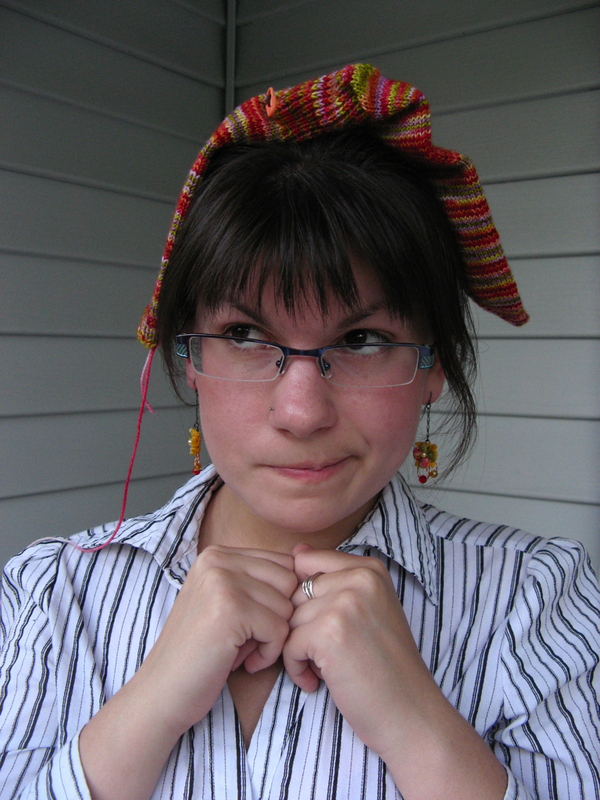 Hat Challenge Post 2: Swatch Time! Hahah! You thought I'd forgotten, eh? Well, okay... maybe I did a little bit. But not entirely! 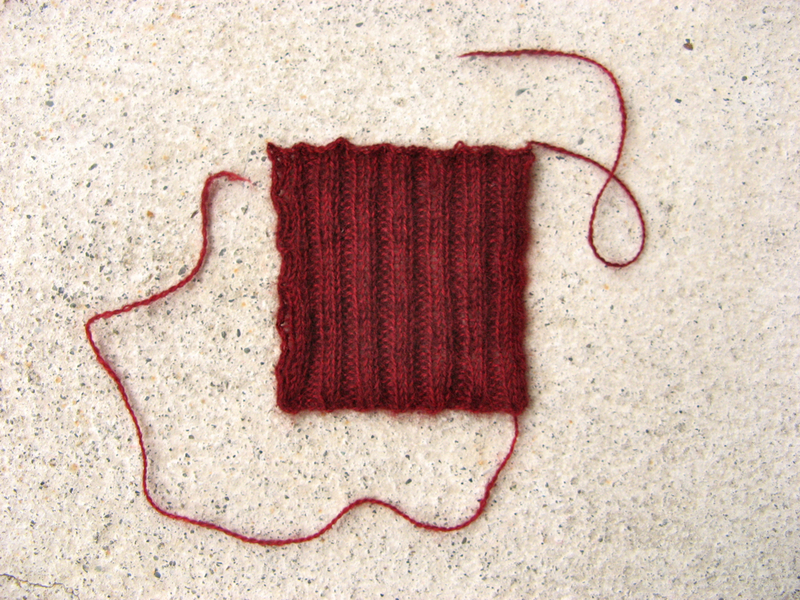 You see, I knit a swatch. And then left it on the armrest of the couch for a week and a half. But the overall point is that I blocked it. And it turned from a perfectly decent little piece of ribbed fabric to perhaps the most beautiful, light, fluffy slip of deliciousness I've ever made. There is nothing quite like the look of freshly blocked ribbing: coaxed into soft vertical lines, expansive and forgiving like the best of old friends. And now I'm really excited to cast on. ... at least, if I got gauge. I've been on a total Madelinetosh kick lately. She is such a genius with colors, especially the very saturated and the very subtle. 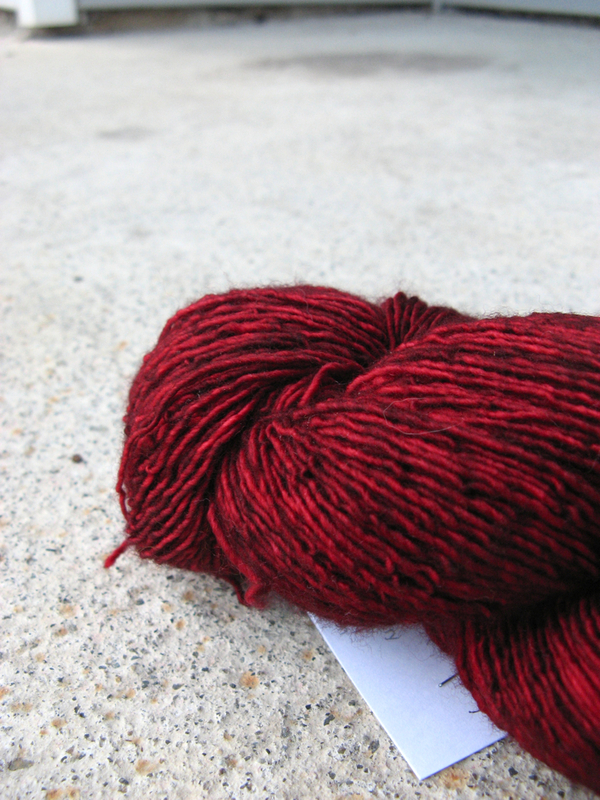 This skein of Tosh Merino Light is in the colorway Tart, a deep red with undertones of black. Stunning. 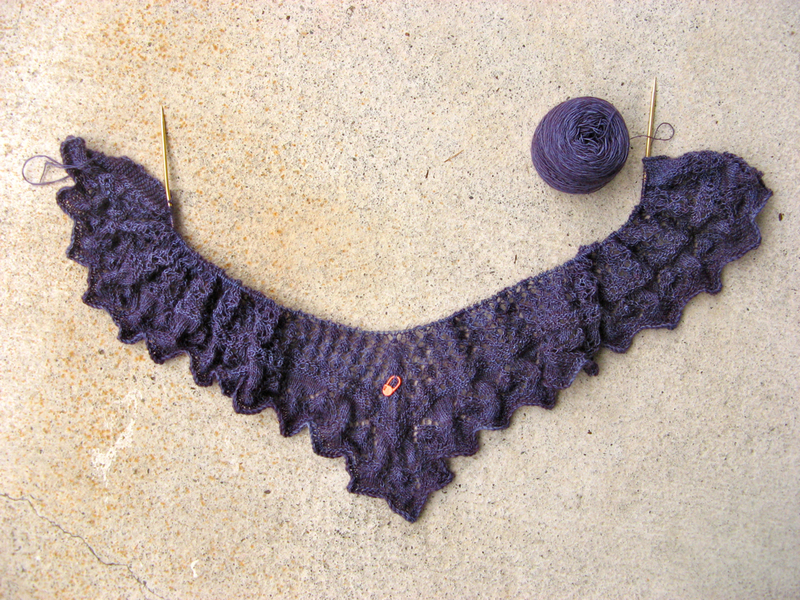 I haven't decided yet what this will be, but I have a feeling it will end up as a shawlette or cowl. Something close to the face, to show off that gorgeous color. And my Fashion School Blows My Mind moment of the day: today I learned how to place darts in a bodice using pencil, paper and a gluestick. Woah. 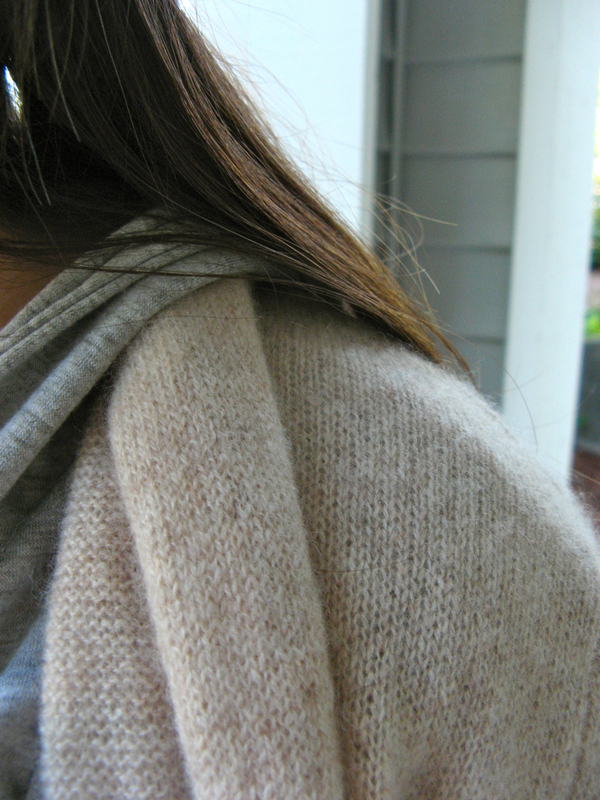 Outfit Post: Neutrals... and Fashion School! But first, some news: today was my second day of class at New York Fashion Academy, where I'll be working on an 18-month program in fashion design. Exciting! So far I've had Fashion Illustration and Draping classes, both of which have been awesome. The school, while called New York Fashion Academy, is located in Ballard, a neighborhood of Seattle. Because I had class today (and also had to drive for 40 minutes and execute a truly exciting parking job), I wanted to wear something comfortable. 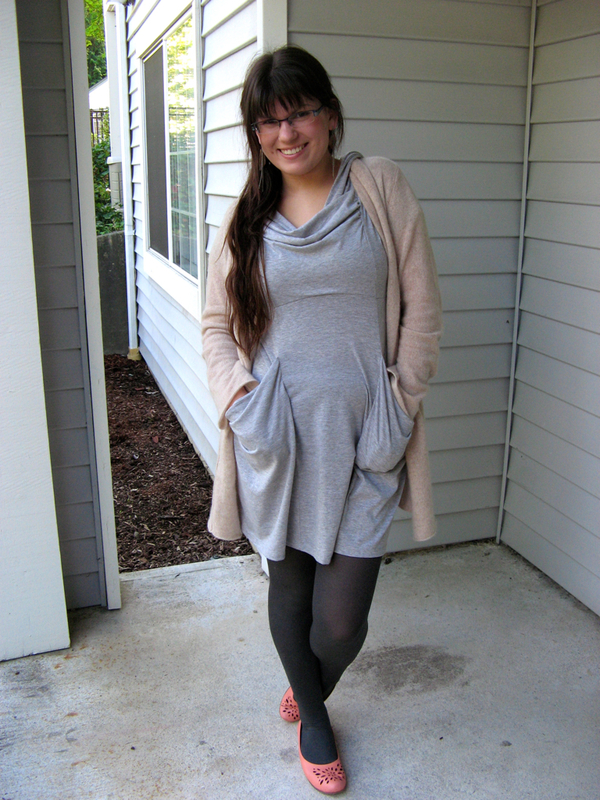 I got this little grey dress a few weeks ago and have already worn it three times - it's super slouchy and comfortable, but it's just designed enough that it looks like I thought about it. Hah! I wanted to play with neutrals today for some reason - maybe it's that the weather has turned a little chilly, or maybe it's that I've been wearing so many bright colors that neutrals seem a good palate cleanser. In any case, I loved the combination more than I thought I would. The cardigan is another recent purchase, a cashmere Cynthia Rowley sweater snapped up at a Marshall's for half the original price. It's so cuddly that Lumberjack has taken to petting my shoulders at random. It's also a really great shade of beige - a little bit heathered and a touch of a peach/pink undertone. I've also been doing a little bit of experimenting with my hair. I was intrigued by the new Garnier silicone-free shampoo, since I've heard that the various silicone compounds in regular shampoo can be bad for long hair by hiding damage and building up in the hair. I've been using both the silicone-free shampoo and conditioner for three or four weeks now, and my hair definitely looks different! It's been taking on a wavier texture, which is fun for playing with. I think it's still too soon to tell how I like it in the long run, since it seems to take a while for my hair to adjust to new things, but so far it's been positive. 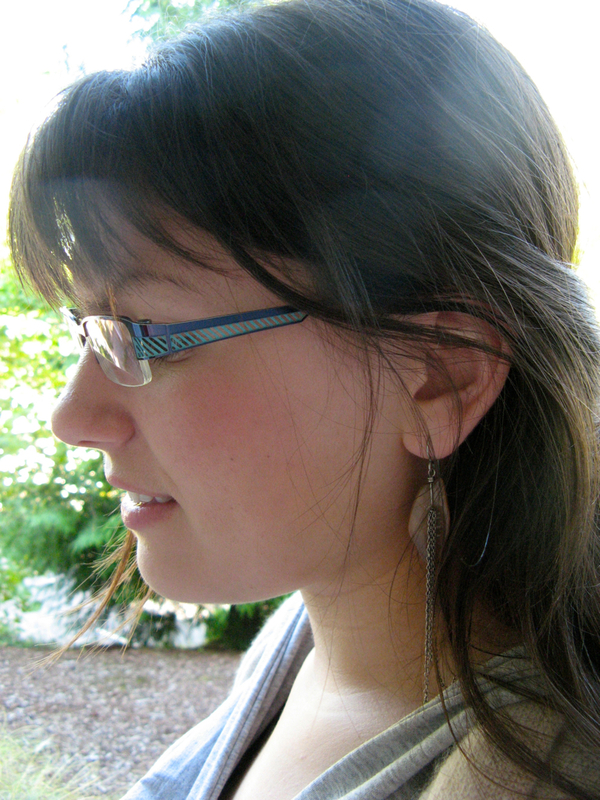 The earrings are from (because I'm predictable) Tasi. I love that they used pieces of wood shaped like feathers, and although you can't see it here, they're asymmetrical. It added a little bit of edge to a soft outfit. I cast on for the Monkey socks... because I cast off the simple socks out of ToshSock! The sock pattern I used was absurdly simple, just a plain stockinette sock with a deep heel (for my big feet) and ribbing at the top to keep things up. So the colors are boinky, but I sort of love them. I've been needing more socks for quite a while now and these will be a good supplement to my sock drawer. Pattern: None! 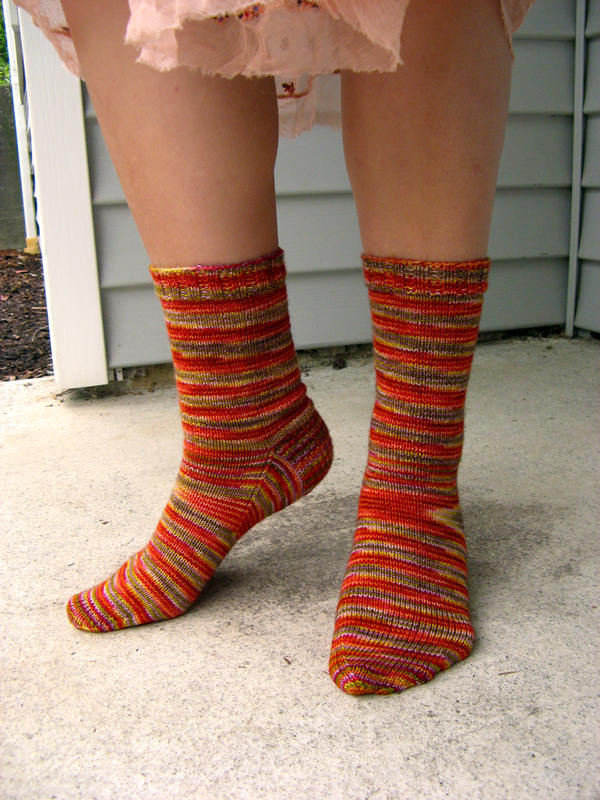 64-stitch basic sock. Rav link here. First, I cannot stop knitting with my 2.5 mm Signatures. What once may have been a "preference" or an "affinity" has become a full-blown obsession. They make a little shick sound when you slide the stitches down them. The points are divinely pointy (if a little scary). Picking up stitches on the heelflap is a breeze. I can't stop. And the second? Well, after five years of sock knitting, I've finally jumped on the Monkey boat. 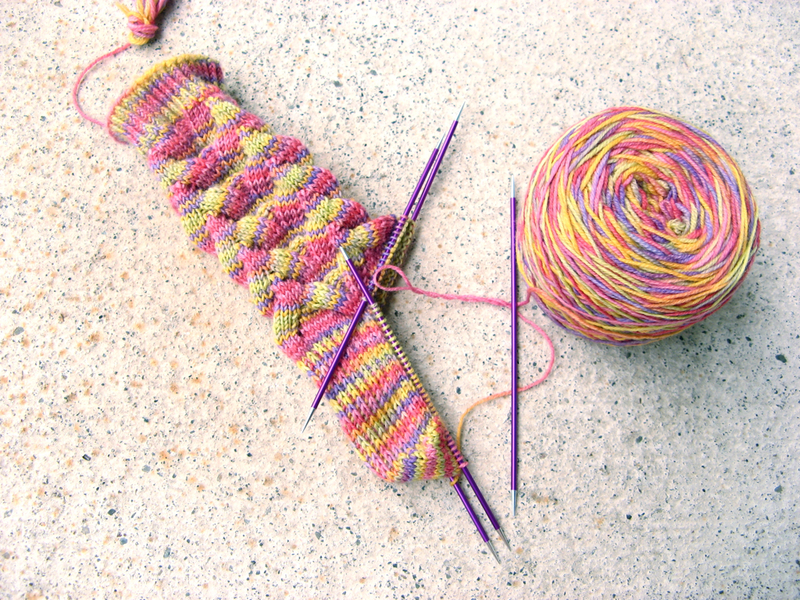 I tried casting on right before Sock Summit with my 2.25 mm Knitpicks needles, but the 64-stitch version ended up too small. 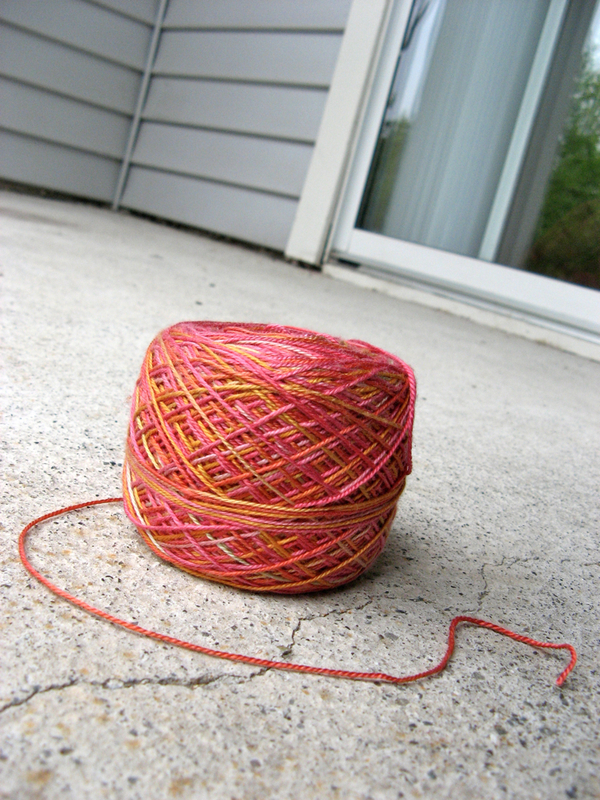 I cast on again a few days ago, and the same 64 stitches on 2.5 mms makes gentle stripes and fits. 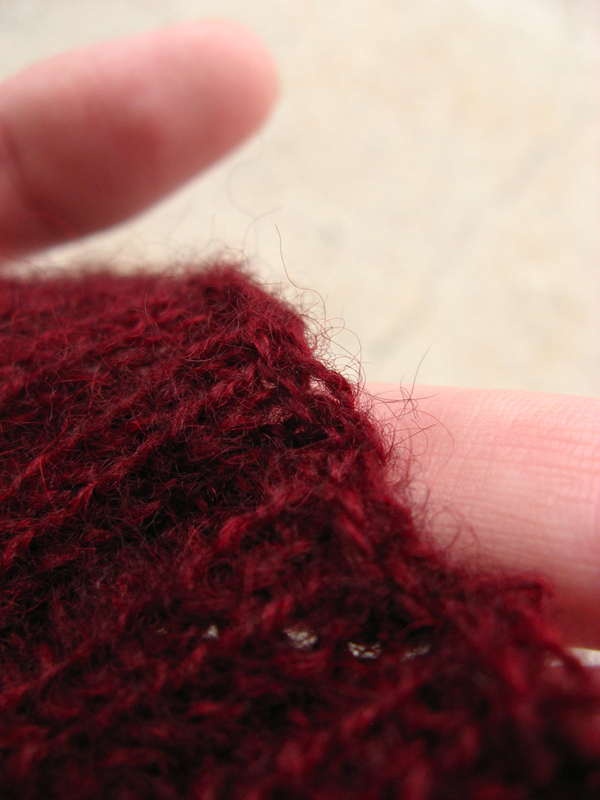 Although, holy moly, how about that unstretchy stitch pattern? I must have high arches, because even though the leg fits perfectly, it's hard to get it over my heel. But don't despair, Monkey - I still love you! The lack of stretch is completely made up for by the way the stitch pattern plays so nicely with the yarn. 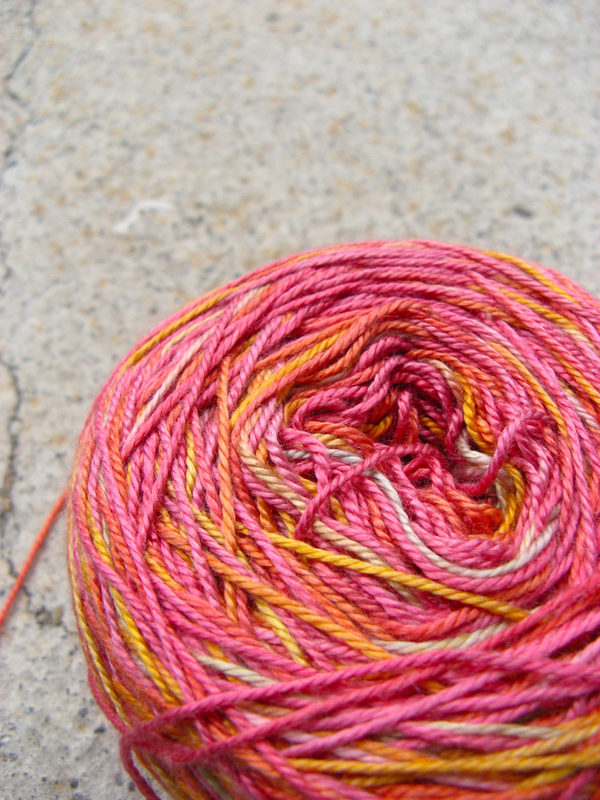 The yarn is a Fiesta color of the month in the August colorway, Gladiolus. 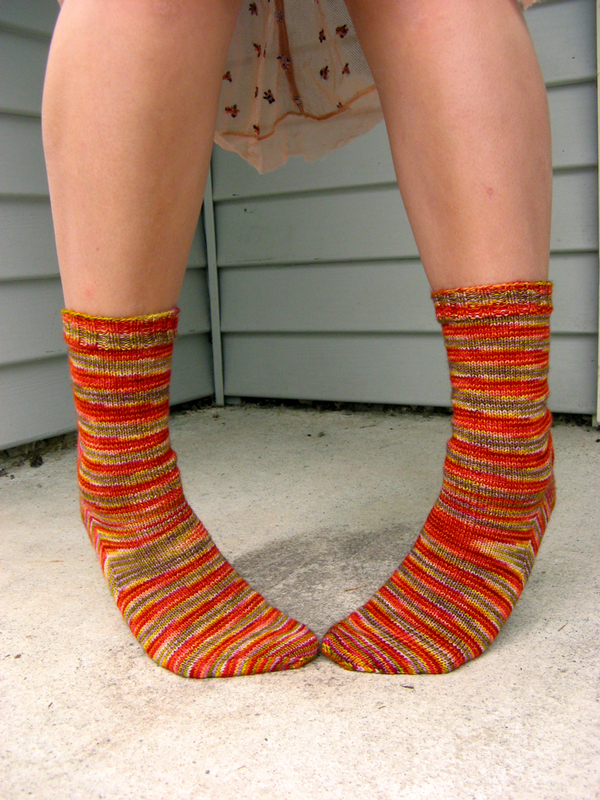 My first pair of socks was knit from a Lorna's Laces colorway that echoes this one pretty strongly - although those socks have long since passed on to the Great Hiking Boot in the Sky, the idea of having another pair of socks in those perfectly springy colors is pretty exciting. For some reason, I really like dressing up on my days off. Maybe it's because I have so many great pairs of shoes that don't get much wear, or maybe I'm just wearing all the outfits I think of during the week but can't quite pull off wearing at work. I just got this dress a few weeks ago and hadn't had a chance to wear it yet. I love the color and the cut of it - the color seems very 70s to me, and the shape is very wearable and flattering (although I will likely wear a camisole under it most of the time, since it takes a bit of fashion tape to keep the neckline in check). I've had an intense fondness for knit dresses lately, probably because they are so ridiculously easy to wear. The shoes are from Heavy Machine, and I love them intensely. They remind me of rocket ships. They're pretty hard to drive in, and not the best for walking long distances, but I think they make almost every outfit a little bit cooler. I don't wear them super often, but they brighten my day whenever I do. I don't usually mess with my makeup much - most days it's Bare Minerals foundation powder and blush, but today I wanted a little bit of color to accent the orange-brown of the dress. I used a turquoise eyeshadow from Make Up Forever and an angled brush so that the shadow looked more like eyeliner - the color is really intense, and I didn't want to overdo it. The hair is an updo I made up when I was fourteen or fifteen and had shorter hair, but have found very useful in the years since. 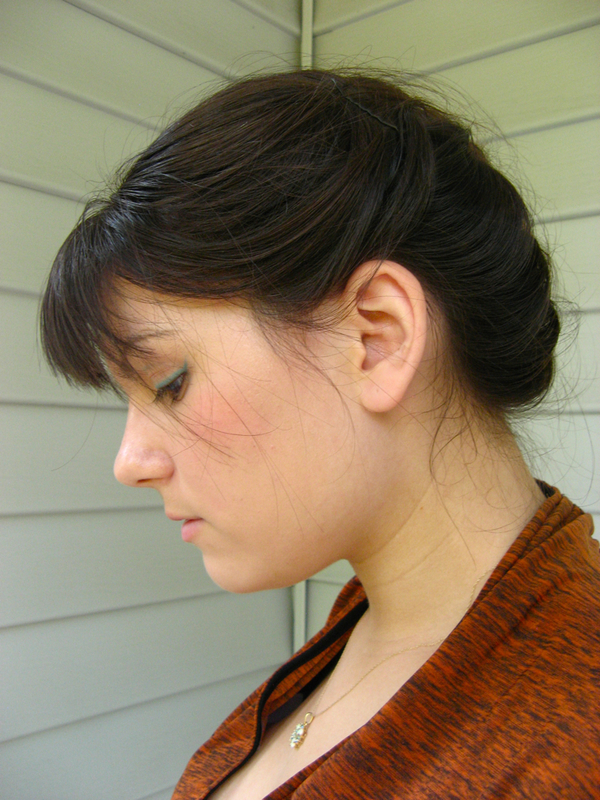 I separate my hair into two sections, French braid them, and then secure them in a low ponytail with an elastic. 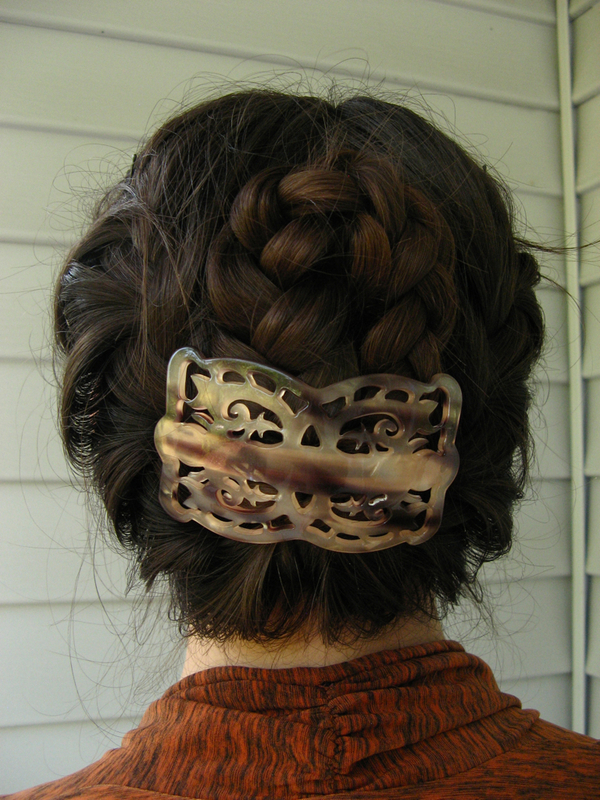 Then I comb the two sections together, braid them into a single braid, and fasten. 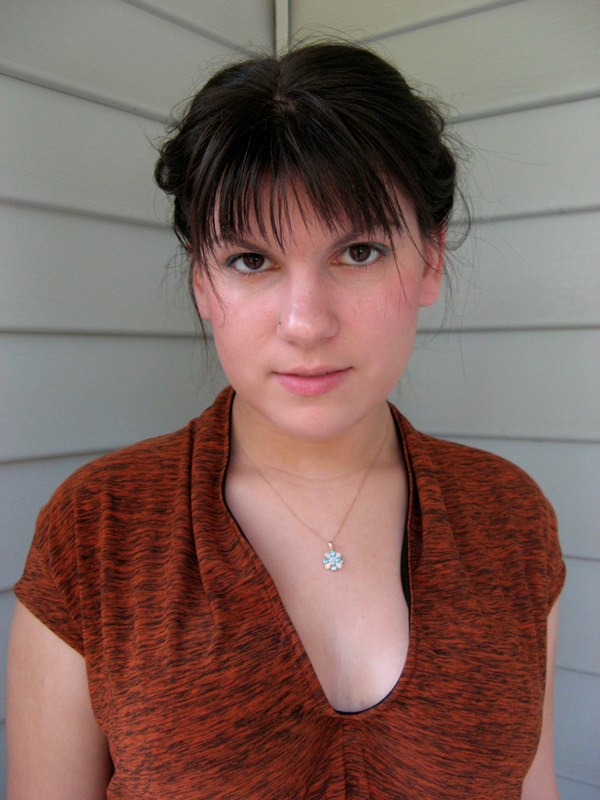 When my hair was shorter, I tucked the tail in between the two sections at the base of my skull, but now that it's super long I had to curl it around and secure it. It stays put all day. My favorite. 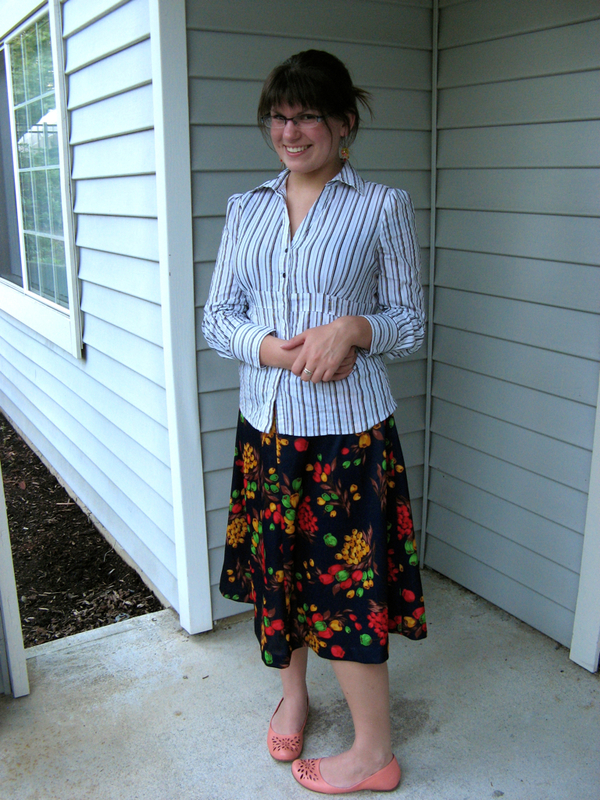 Okay, so I haven't been trying very hard on the outfit front lately. I roll out of bed and look at my closet, and then I feel very tired and want to go back to bed. This is compounded by the fact that, because my skin is on hallucinogenic drugs from approximately March until October of every year and is currently having a particularly adorable tantrum, I have to wear long sleeves. Needless to say, I am greatly unamused by this. Yesterday I felt like sort of trying, even with the "work-appropriate" and "long sleeves to contain troll elbow" stipulations, and ended up with this. I adore this skirt, which is polyester (usually yuck; sometimes spectacular) but has the greatest 70s-tastic print ever. Look at those neon tulips. Who could not love, or at least be somewhat entertained by, neon tulips in autumnal colors? Speaking of things being on hallucinogenic drugs: this fabric's designer was, probably. Anyhow, about a month after receiving my Danielles and wearing them quite a bit, I'm insanely happy with them. I love the coral color, which adds a little bit of interest to even the most boring of outfits, and they're comfy enough to walk the two miles from the bus stop to work and back in the morning. I usually wear a 9.5 or 10 in Fluevogs, but I tried on a pair of these at the store a few months ago and knew to order way, way down. I haven't been a size 9 since I was probably fourteen, but somehow these are. I thought they might be a bit too tight when I first got them, but a few weeks of breaking them in has made them the perfect length and width. Another great pair of 'Vogs. WIP: Socks Go On An Adventure! So although I haven't been blogging much lately, there has been a large amount of knitting happening. 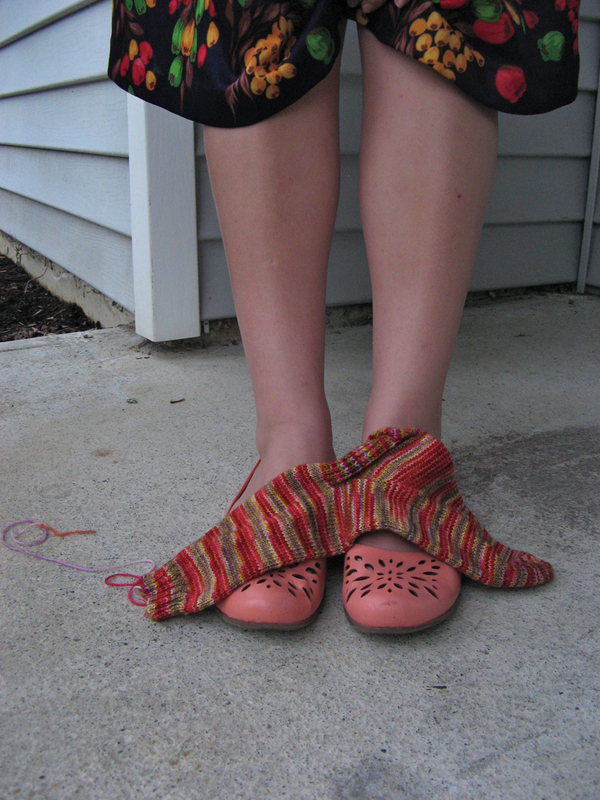 Not only that, it's sock knitting! 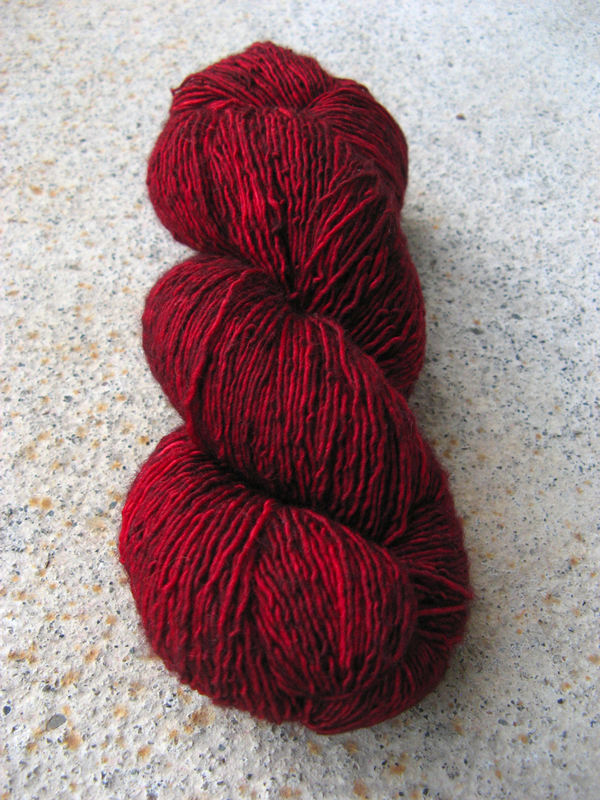 I had a skein of Madtosh sock in the colorway Rhubarb that was sitting around for, oh, you know, like two years. And that's not even deep stash. Geez. 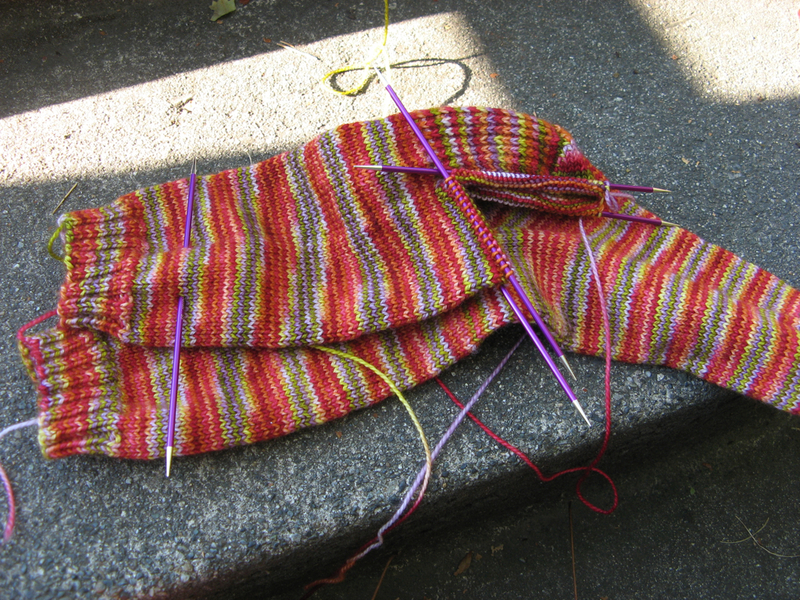 Anyhow, I decided to cast on for a pair of 64-stitch stockinette socks, the same way I did with the Home Socks. And today, Finished Sock and Second Sock went on an adventure! (My other WIP socks seriously hate Finished Sock for having a Second Sock already. They wonder why she is more special than they are.) They came with me to the bus stop on my way to work (above). 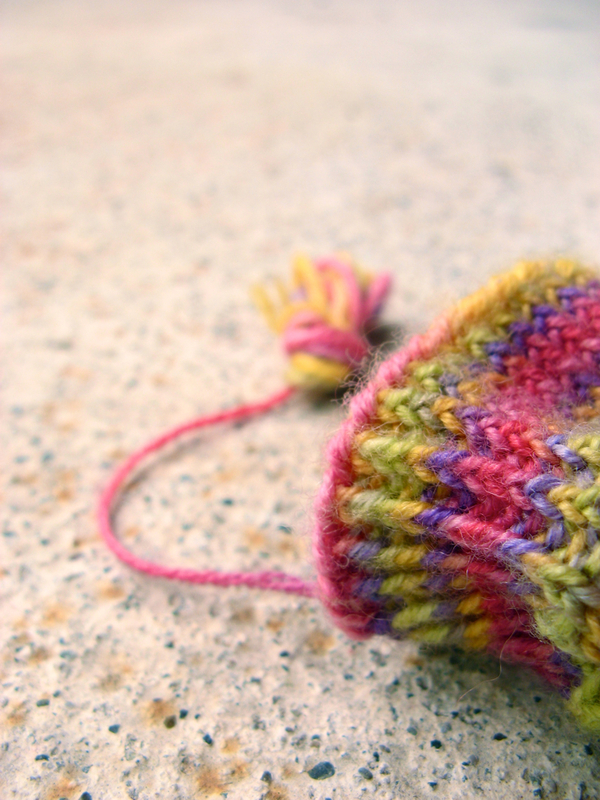 And why yes, I am knitting them on my fabulous Signature 2.5 mm DPNs, a graduation gift from my friend Sparkle. They are sort of the best needles ever. Then Finished Sock got tired of laggy old Second Sock, and went for an adventure on her own. And finally, she was tired, and took a nap on my feet. Good thing she likes them, because they're going to be spending a lot of quality time together, very soon. These pictures are from a few Saturdays ago, when Lumberjack and I decided to venture out into the city for some lunch, which ended up being brunch at a restaurant in Bellevue called Z'Tejas. Lumberjack had Chicken and Potato Hash (with a fried egg on top!) 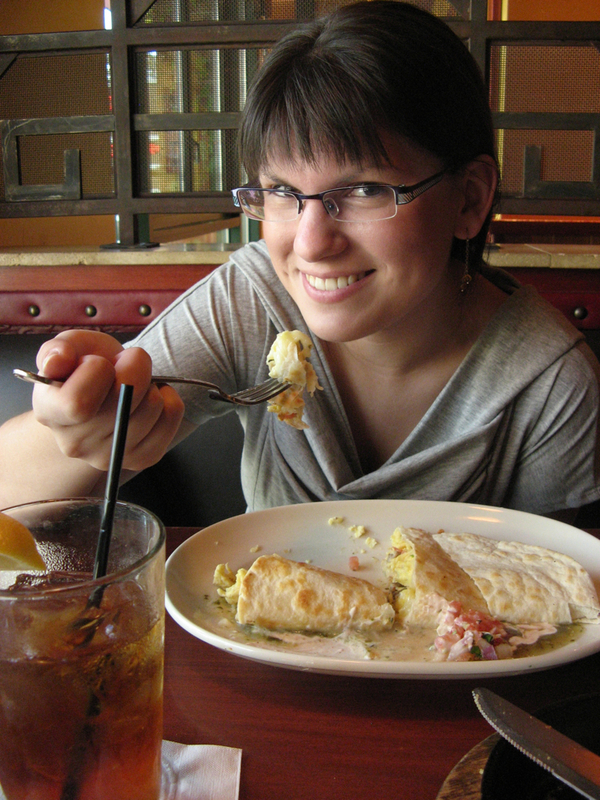 and I had a breakfast quesadilla with bacon and tomatillo sauce, both of which were extremely delicious. 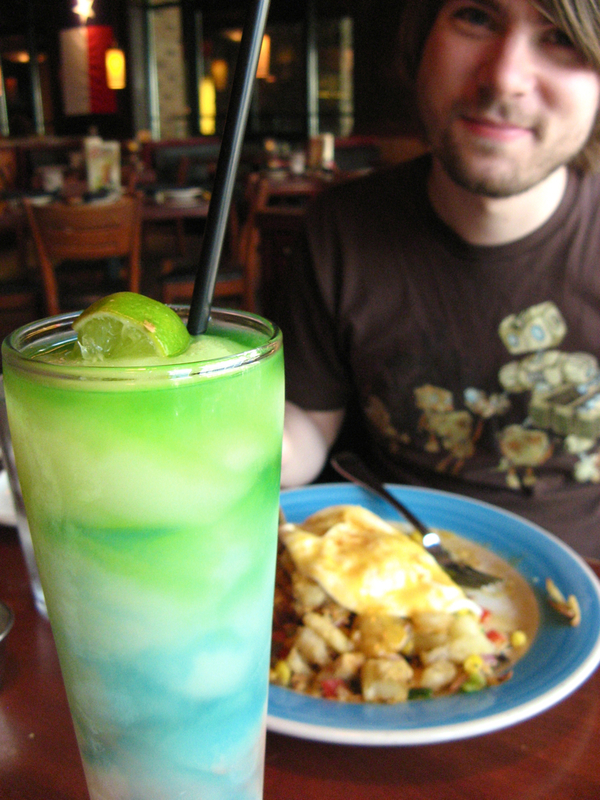 I recently developed an allergy to avocados (which is perhaps the saddest allergy ever) and I have to be pretty careful at Mexican-style restaurants, because avocado is on everything! I didn't have any trouble the day we went for brunch, but we ended up going back later that week, and I had to send back a sandwich because it had avocado that wasn't listed on the menu. I usually check when I order, but didn't this time - that'll teach me! These last couple of weeks have been crazy - I finished my grant from Oberlin last Wednesday, then had a crazy weekend out with Lumberjack and my brother, then went to see Lumberjack's grandmother on Monday. Is it bad that I'm already ready for the weekend again?